Weight Watchers Peanut Butter Whip Frozen Treats! 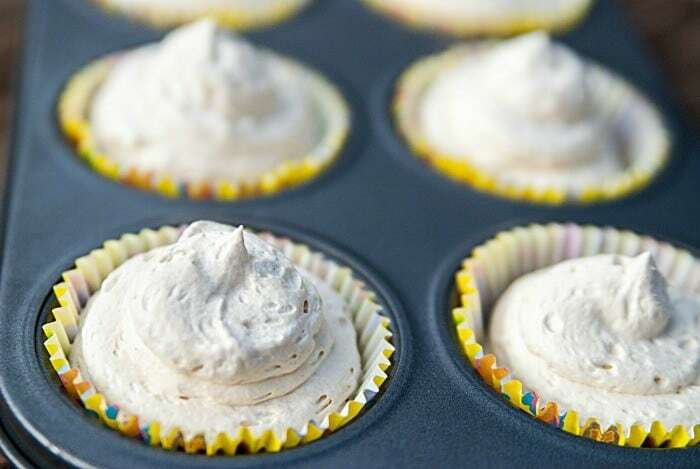 Weight Watchers Peanut Butter Whip Freestyle Update – Scroll down to the recipe. If you use fat free cool whip and add 6 Tablespoons of PB2 Powder. Divide the mixture into six cupcake papers/tins. This recipe will be 3 Freestyle Points per serving. If you want a peanut butter treat, budget those smart points! You can use real peanut butter and it will be 4 Freestyle SP. 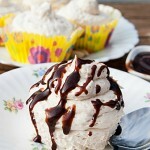 I found this recipe for Weight Watchers Peanut Butter/Cool Whip Treat while reading the blog Stockpiling Moms. I thought it sounded delicious, plus super easy, so I decided to give them a try. 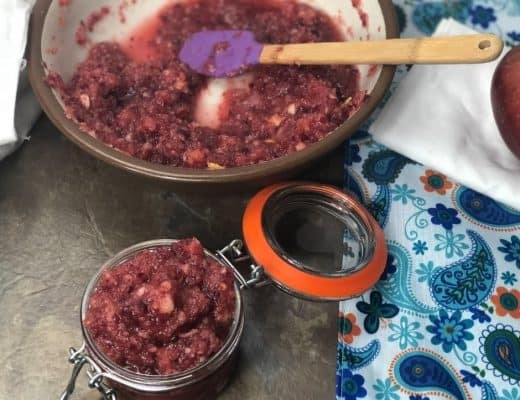 You may see a few products I recommend to use for creating recipes throughout this post. These affiliate links are provided for your convenience and I may earn a commission from your order. Since our first few attempts at this recipe we have perfected it and updated the photos. Huge difference! Of course, we changed the recipe up a bit and we were delighted with the yummy results. This updated recipe was made with peanut butter, not PB2. The original recipe made 12 treats and this one will make 6 larger treats. We hope you enjoy Weight Watchers Frozen Peanut Butter Whips! 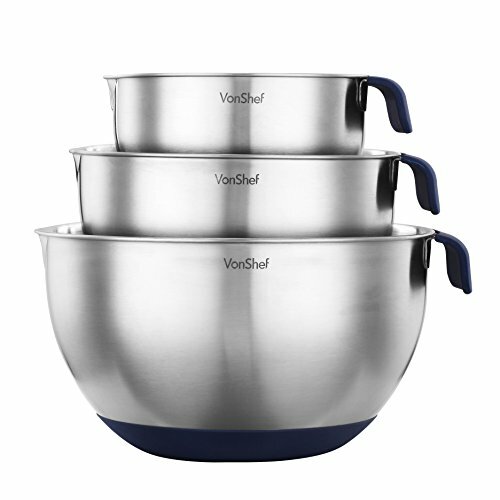 These mixing bowls with the silicone bowl are the best. I used to put a wet towel on the counter to keep my bowl steady. These bowls make my baking life easier thatn ever. Get yourself a set and you won’t want any other bowls. 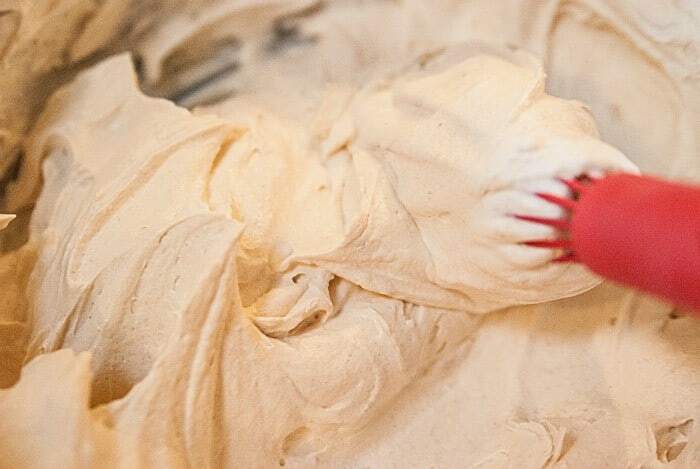 Slowly fold in the cool whip until blended, try not to over mix. A whisk works best, not electrical appliances necessary. Fill an icing bag (affiliate) or pastry decorator with the mixture and evenly divide the mixture into 6 muffin tins. Each tin will have approx. 5 tablespoons of whipped up peanut butter goodness in it. If you don’t have an icing bag, you could try a ziploc bag and cut off the corner. You can also use a spoon or rubber spatula, but the Weight Watchers Peanut Butter Whips won’t be light and full unless they are piped in. 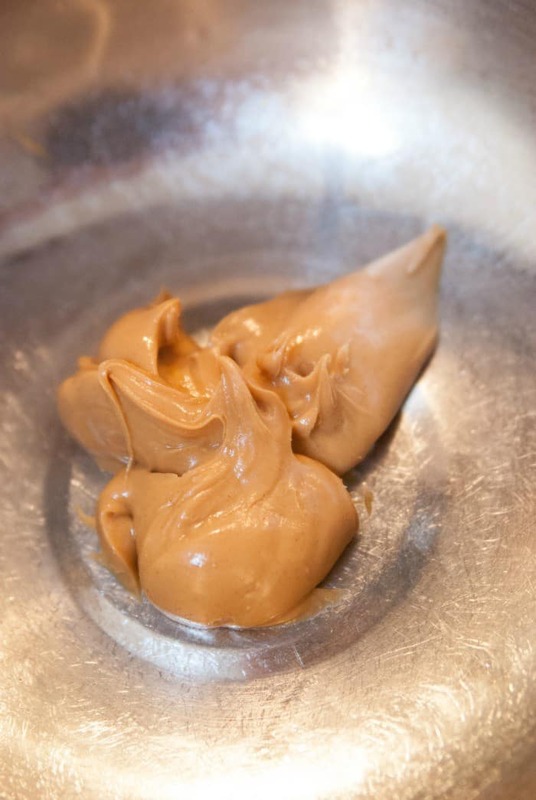 Freeze your peanut butter whips until solid. Remove from cupcake liners. 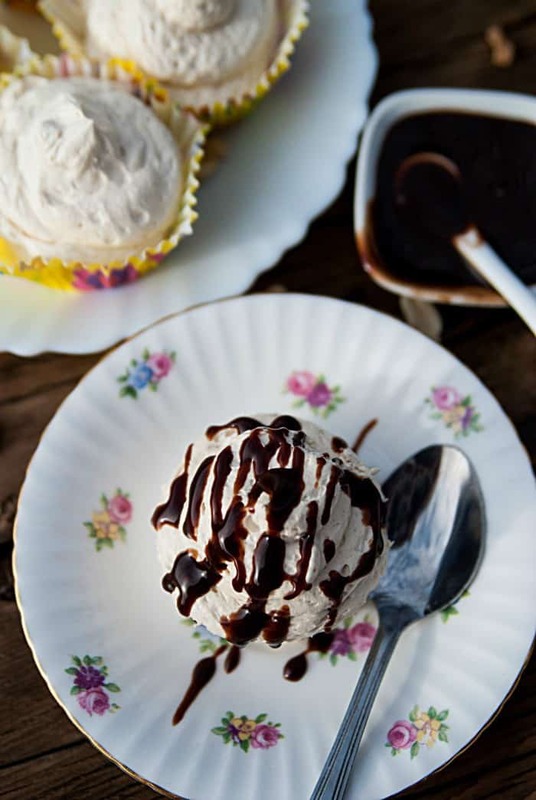 Heat 1 Tablespoon of sugar free hot fudge sauce (affiliate) and sprinkle on each Peanut Butter Whip. Serve immediately! Weight Watchers Peanut Butter Whip Frozen Treats! 1 Point!! 3 Tablespoons of Peanut Butter or 6 Tablespoons peanut butter powder. Place peanut butter in large bowl. Gently fold in whipped topping. (must be fat free to obtain one PPV). Spoon or pipe mixture evenly (approx. 5 Tablespoons) into 6 cupcake liners. Heat fudge sauce into microwave for a few seconds and drizzle on top before serving. 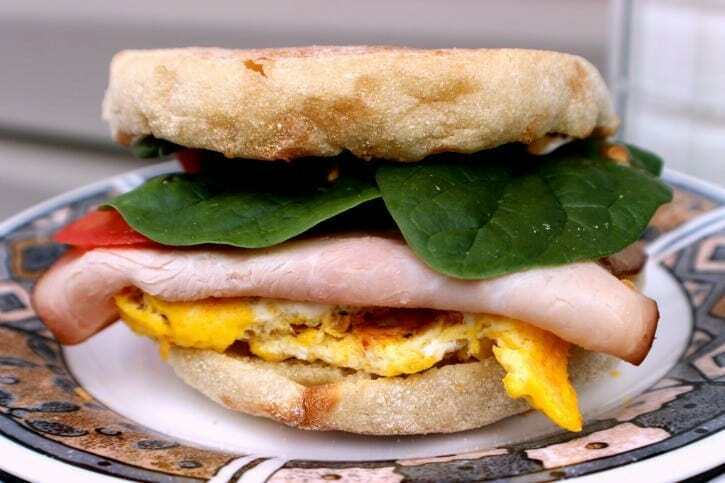 WW PointsPlus® for this recipe has been calculated by Just 2 Sisters and has not been endorsed by Weight Watchers International, Inc.
We plugged all the ingredients using PB2, not peanut butter, into the Weight Watchers program and came up with the points plus value. If you skip the hot fudge sauce (affiliate) the point value would be even lower. Oh and completely not Weight Watchers, but I think this recipe would be perfect filling in between 2 cookies for an ice cream sandwich. YUM! These look delicious! Do you have other weight watcher’s recipes as well? Thanks for stopping by Chelsea. Just getting into the Weight Watchers recipes. Stay tuned for more! Thank you for sharing your recipe, love them. Hope you can share more as time goes on. Good and easy, my kind of desserts! Thanks, Ellen! 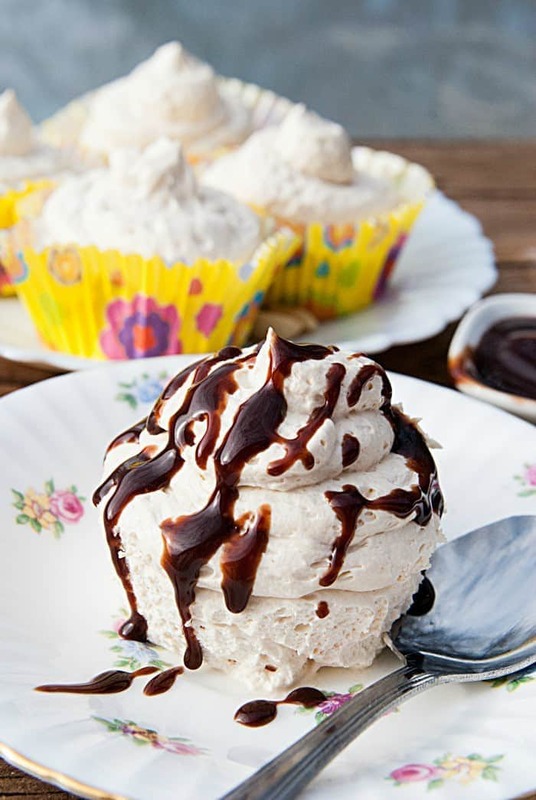 I made these and I used the peanut butter powder 6 Tbsp because I hate all the points in regular peanut butter, fat free whipped topping and 1 Tbsp fat free chocolate syrup per cupcake and had it serve 6 and I got 3 smart points. I never updated this recipe to smart points because it’s all processed ingredients and saturated fat is high in peanut butter. I assumed it would be between 6 to 8 points per serving, thus not recommending this on the new smart points plan. I made them in the mini cupcake cups with peanut powder and the light cool whip and chocolate sprinkles- 1 smart point each. Just the thing when you need something sweet but are running low on points! Hi Michele, you could try Almond milk or even cashew milk. You can even make them your self. There are several good web sites on making both. Just type into any search engine and you will find all kinds of recipes. Substitute dream whip. For cool whip if you think cool whip is bad. Actually, the “preservatives” and “chemicals” won’t hurt you. Don’t fall victim to chemical fear mongering. Everything you eat, touch, and use every single day is made up of chemicals. Many of which, are hard to pronounce. Even “organic” products are full of them because literally everything is made of chemicals. Even so called “GMO Free” food are full of chemicals. In fact, all food is genetically modified and it has been for millennium. Our ancestors cross bred crops to ensure better harvests and stronger products. Now, we have the power to grow crops that are immune to diseases, stand up to man made climate change and produce more nutritious food. As a former chemistry teacher, I totally agree. Thank you for pointing this out. I agree!!! 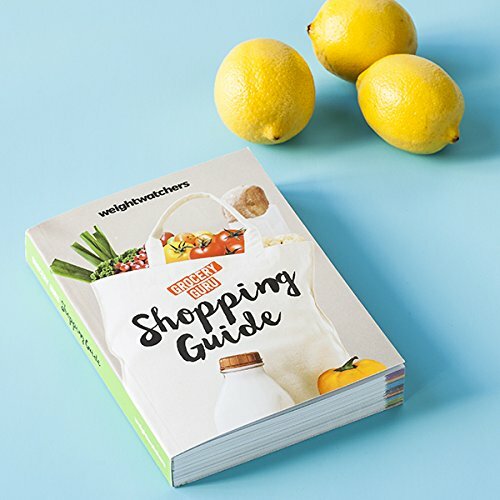 , I’m going to make my own whipping cream and fudge sauce and sweeten it up with honey or natural stevia , when I try this! You are so right on this. I agree! Do not use cool whip, it’s not good for you! 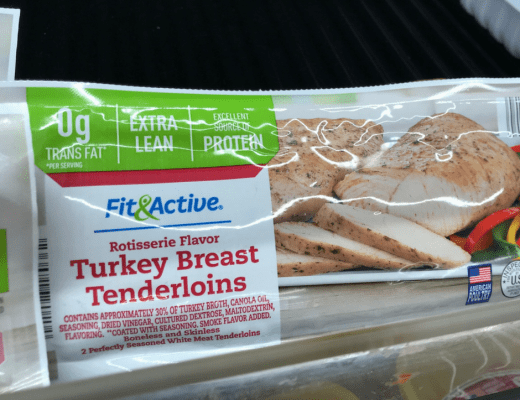 Do you have the calorie count and information for these? 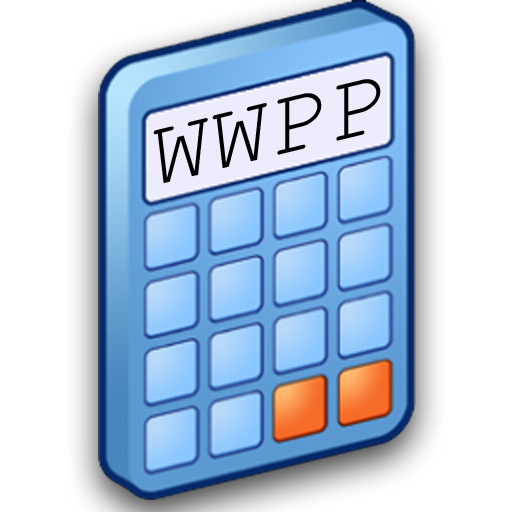 Bloggabella » Blog Archive » it’s WEIGHT WATCHERS WENNNSDAY! So you can substitute real p.b instead of the powder?? Hi I was wondering how much goes into each cupcake liner? Cool whip has 3 grams carbs for 2 tbsp. Just wondering how many tablespoons is in one container? Man that is ALOT of carbs…..I do better loosing weight when I avoid them. Never did figure out the “1 point” on weight watchers things…..how can that many carbs be one point? It’s 1 point because WW points aren’t based on carbs. I would like to try these but we have a peanut allergy in our home. Any suggestions? Yum hard to believe it’s joust one point! Thanks for linking up to Merry Monday! Sharing on FB! Have a great week! I’ll have to figure out the carbs on this, but it sounds perfect. Is this under the new smart points or figured under points plus? 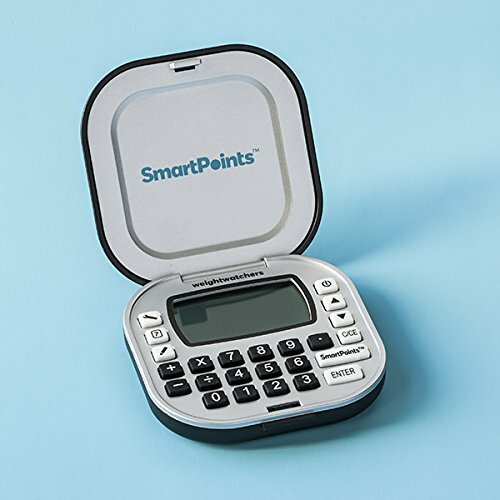 We shared the image of the points calculator in the post. 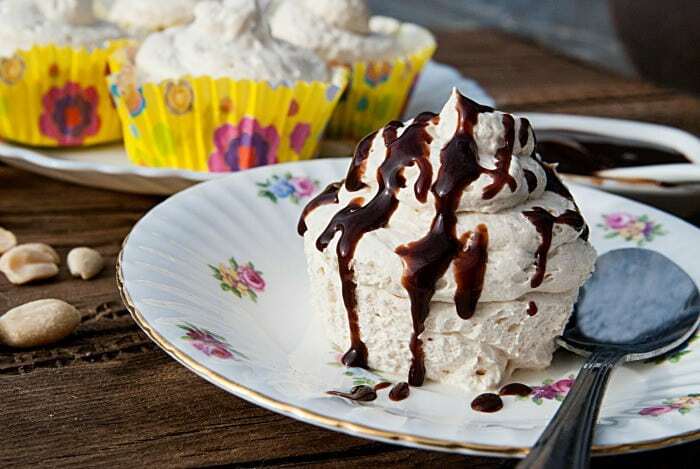 The recipe is based on fat free cool whip, PB2 powder and sugar free chocolate syrup. That’s how it all calculated out in the PPV system. Thanks! If you are using the new SP, then the 6-count ones are 4 points each, not 1. FF Cool whip, real PB and Sugar Free Hot Fudge in the current calculator. But PP worked well for many and they may not have switched over yet. This is an older post, so the OP left the PPV. I used the PB powder dry. Thanks and hope you enjoy the recipe! I’m seeing 6 teaspoons and 6 tablespoons for the PB2. My friend made it with teaspoons and found not a lot of peanut butter flavor (but still good). Is it teaspoons or tablespoons?’ Serving size on jar is tablespoons. Thank you. Hello Linda. Oh my word. It should be 6 TABLESPOONS of PB2. All the years this recipe has been up and no one ever pointed out the mistake. THANK YOU!! Just made these today and they turned out amazing! A wonderful light dessert. However with the new Smartpoint system these are no longer 1 point. I calculate 4 points per serving. 🙁 But still yummy! I agree. 4 points without the topping. Still yummy! Just made so but put a tbls of chocolate chips on top.lettig thm chill. Can’t wait to taste! Love peanut butter and chocolate together! About how long do they take to freeze? They are usually frozen in about 2 hours. I guess it all depends on your freezer. With the new “Freestyle” system, it comes out to be 7 points for 6 servings. I used peanut butter instead of PB2 and lite whip cream. (I couldn’t find fat free) I made these hoping I could have one today, and I won’t be able to. How long will they stay in the freezer? I tried rating it but it wouldn’t let keep one star. Sorry you are having problems. IF you follow the recipe as listed it’s 3 freesytle points for a PB2 recipe and 4 Freestyle points for peanut butter. Sorry you couldn’t find the fat free cool whip, but that is what the recipe states. They should be fine in freezer. I pop mine out and put them in a freezer container. If the recipe as listed is 3 Freestyle points with PB2 and 4 with peanut butter as it says in the blurb directly above the recipe, why does the name of the recipe say “one point!! !” I assume because this was an older recipe that was fewer points under a previous program,but it’s very misleading. not sure where people are coming up with 7 and 8 points, tho. These are very tasty even made with the PB2. You need to make them in mini muffin cups and make 12 to get them down to one point, though. Graham crackers would work for a WW ice cream sandwich! 15+1+11 = 27 ……. 27/6 = 4.5 but the WW App rounded it up to 5 points. The points shown on the recipe use PB2 which is much lower in points than then peanut butter. Also the points are changed in post to reflect freestyle update. THANKS!! thanks for the recipe, will have to five these a try. Might even try it with Peter Pan 1/3 less sugar and see how it comes out. Just found your site from cottage home. Yummy. I will be joining.